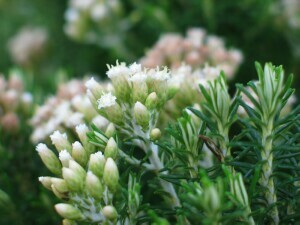 Native to New South Wales, Victoria and Tasmania. 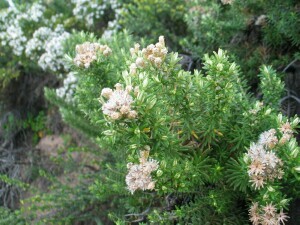 Erect bushy shrub from 1-2 m tall, with branches covered in a dense white mat of woolly hairs. Leaves narrow from 10-25 mm long and 1-1.5 mm wide with recurved margins. Upper leaf surface green and only slightly woolly. 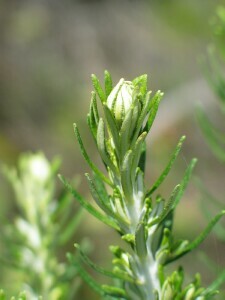 Under leaf surface and young leaves greyish white and woolly. Flower-heads numerous in dense clusters at the ends of branches. 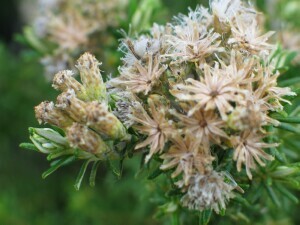 Each flower-head 5-7 mm diameter and 6-8 mm long with thick, opaque to straw-coloured, outer bracts. Flowers 15-30 per head and white. 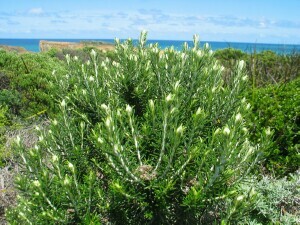 Frequent shrub of coastal dunes and cliffs along the coastline.